PHOTO BY JILL GOSCHE Collin Snyder (far right) speaks during the EMS Star of Life Awards ceremony in Columbus as his rescue team stands nearby Tuesday afternoon. To view more photos from this event, visit cu.advertiser-tribune.com. COLUMBUS — A Fostoria man says he thanks God every day for the people who helped save his life. In October, Collin Snyder, his wife, Rachel, and their son, Samuel, who now is nearly a year old, headed to the backyard of their Walnut Street home to play catch with their Labradoodle, Micah, and had been there a couple minutes when a boy shot a broadhead arrow with a hunting tip toward a target. The arrow ricocheted off a nail on a deck, traveled over a fence, into the yard where the family was playing, and lodged in both of Collin’s legs, nearly severing the femoral artery in his right leg and hitting a branch of the femoral artery in his left leg. “It was pure accident. … We just feel like someone guided the arrow,” Rachel has said. 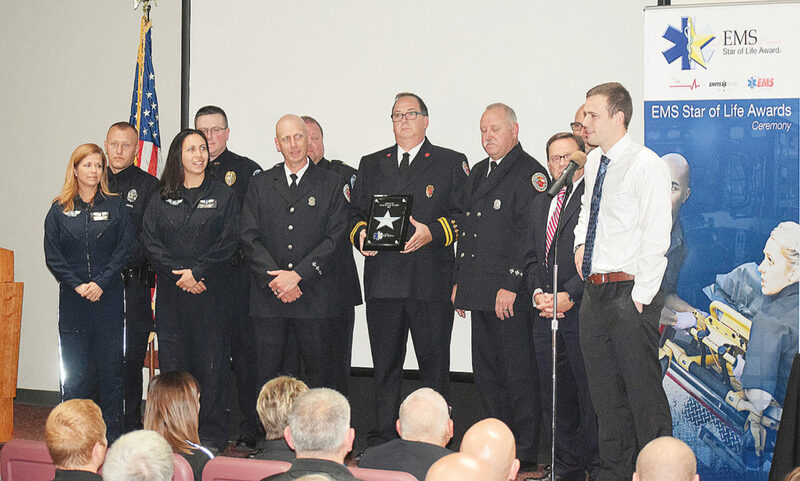 For its rescue efforts in Collin’s accident, Fostoria Fire Division received one of 14 EMS awards during a ceremony in Ohio Department of Transportation’s auditorium Tuesday afternoon. Collin said each rescuer did his or her job that day. “They helped save my life. They have made my life back to pretty much complete normal,” he said. Those honored included Capt. Jerry Goodman; Harry Miller, a firefighter/EMT; and Kyle Blausey, a paramedic, who responded for Fostoria Fire Division; Sgt. Kent Reinbolt and Officer Travis Ricker, who responded for Fostoria Police Department; and Dr. Alexandra Murray, nurse Jen Mullholand and pilot Will Deaton, who responded for Life Flight. The 18th Annual EMS Star of Life Awards ceremony, part of National Emergency Medical Services Week, was hosted by Ohio Department of Public Safety’s Division of Emergency Medical Services, State Board of Emergency Medical, Fire, and Transportation Services and Ohio Chapter of the American College of Emergency Physicians. EMS stars also were presented to Akron Fire Department and EMS; Beloit Fire Department and EMS Division; Bluffton Emergency Medical Services; Eaton Fire Department; Grafton Township Fire Department; Greenville Township Emergency Services; Honda Emergency Services and Anna Rescue Squad; Madison County Emergency Medical District and London Fire Department; Miami Township Fire and EMS; Stow Fire Department; Valley City Fire Department; and Westlake Fire Department. John Born, director of Ohio Department of Public Safety, told attendees they are not saving lives — they are providing opportunities for people to live. They are the embodiment of what it means to put service before self, Born said. “Thank you for what you’ve done. … People’s lives count on you,” he said. Collin eventually lost consciousness after the shooting accident, and the crew performed CPR, successfully restoring his pulse, on the way to ProMedica Fostoria Community Hospital. He was flown from Fostoria to ProMedica Toledo Hospital. After the accident, Collin reflected on the fragility of life and said everyone has the same destiny: One can’t come out of life alive. But, he said, the things one does in life define the person. “There’s hope beyond the grave. … There’s hope beyond death,” Rachel has said.